Residents of Atin-Kok and Abango Imany parishes in Abia Sub-county Alebtong district are counting losses ahead of Christmas after a night heavy downpour accompanied with hailstorm destroyed crops in the gardens. The surprise rain happening in mid December, the time the farmers consider is the beginning of the dry season, destroyed mainly the simsim, sunflower and soya beans now at their stages of harvest and cassava. 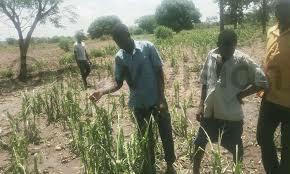 Joseph Okello Ongom a resident of Acan-Pii in Atin Kok parish revealed that he has lost a good acreage of maize plantation and is now stranded since it was the only source of his livelihood for the year. The LC 3 Chairperson for Abia Sub-county Mr. Kwenya Sam confirmed the incident saying crops in over six villages were crashed beyond recovery, requiring them as leaders to do everything possible to respond to the disaster.